Alfredo Haberli is a pretty smart guy, and he's also a pretty good designer. He realized that people sitting on a chair might need a table to go with it. Maybe they'd want to just put their drink on the table, but maybe they'd need to write on it too, or put their laptop on it. So rather than design a chair and then designing a table to go with it, he designed the Solitaire, which is both at the same time. I saw the chair while browsing the Offecct site, so never having sat in it I can't say how comfortable it is. But I'm assuming you can either sit on it with your legs forward, in the traditional manner, or with your legs under the table part. Cool, huh? Yeah, I thought so too. With all that functionality, though, the design is still straightforward and clean. The only thing the Solitaire is missing is a price. I couldn't find one online. I mean, I know it's got to be expensive, I just don't know how expensive. For now I'd just assume that "how expensive" equals "very" or possibly "very, very." man, i like that chair. the fact that it has a swiveling base is just gravy. Mmm...pretty. Well, I can maybe buy one if I sell my car. Then I can sit in it and think about all the places I need to be. God this furniture is bloody amazing! Can I ask one thing? Whats the reasons these are on your site,do you have a company? I am in year 12 and is also keen on design except I arent an excellent person skilled in drawing.Is there any tips on where I should go after year 12? Thanks so much awesome pictures! Yea.It is amazing way and pretty good idea to built *table go with chair* This is the first time I saw it. God bless. 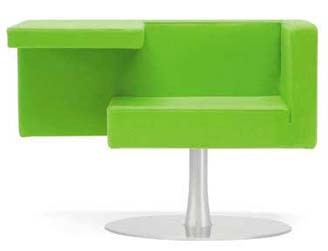 That chair is funky and I like the lime green colour, most cool.